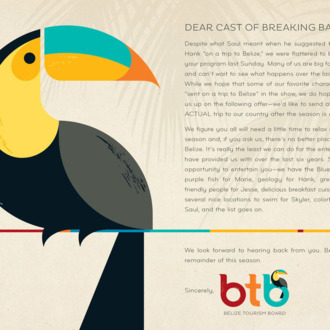 On this past Sunday’s Breaking Bad, Saul suggested to Walt that he take out Hank the same way he took out Mike: By sending him on a “trip to Belize.” Oh, he was using that as a euphemism for murder, but the Belize Tourism Bureau was not about to let an opportunity go to waste. It started with some jokey tweets, but now the tourism board has extended a full-on, adorable invitation to the whole cast. Despite what Saul meant when he suggested that Walt send Hank “on a trip to Belize,” we were flattered to be included on your program last Sunday. Many of us are big fans of the show and can’t wait to see what happens over the last six episodes. 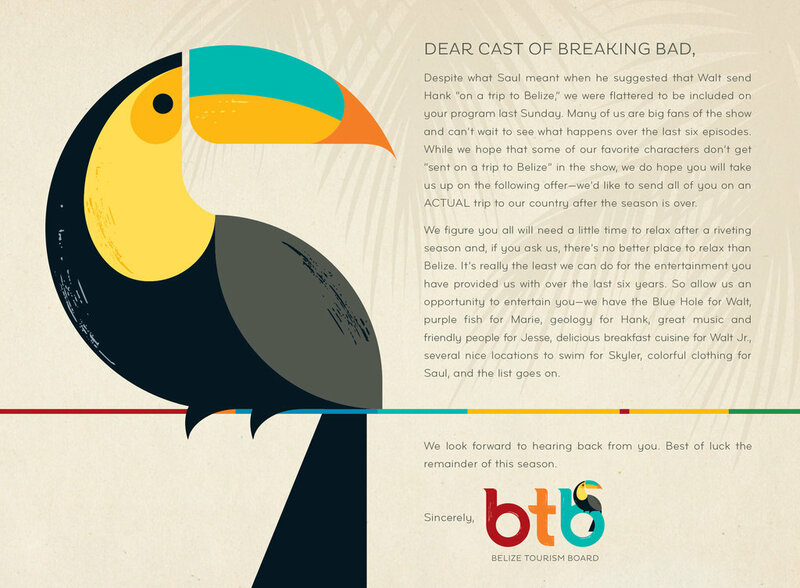 While we hope that some of our favorite characters don’t get “sent on a trip to Belize” in the show, we do hope you will take us upon the following offer — we’d like to send all of you on an ACTUAL trip to our country after the season is over. We figure you will all need a little time to relax after a riveting season and, if you ask us, there’s no better place to relax than Belize. It’s really the least we can do for the entertainment you have provided us with over the last six years. So allow us an opportunity to entertain you — we have the Blue Hole for Walt, purple fish for Marie, geology for Hank, great music and friendly people for Jesse, delicious breakfast cuisine for Walt Jr., several nice locations to swim for Skylar, colorful clothing for Saul, and the list goes on. The fact that baby Holly is not included in this letter is probably a clue!